With all of the media coverage of Michael Brown in Ferguson, Eric Garner in New York, and many others, it’s a pretty timely topic. Everyone is up in arms about police brutality and stereotyping African Americans, but what about the rest of us? 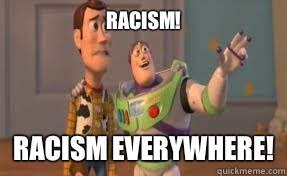 And what about racism in other areas, like schools and stores? I went shopping with my family at a store, one we go to so often that the staff knows who we are and even stop for small talk. It’s usually a nice atmosphere, a time for us to spend as a family. But last night we were treated like foreigners, like garbage. When we were checking out, one of the cashiers was giving us a nasty glare and watching our every move. We ignored them and remained jolly and thanked them when we were done. As we were leaving that same cashier came running to us asking us where we had gotten the coupons, since they weren’t in color (apparently they only gave out red ones). We explained the back story but the cashier still didn’t believe us. She repeated many times (in slow English, as though we didn’t understand her the first time) and then let us to go. As we stepped out of the store, I turned around to see her calling other cashiers to show them the coupons and most likely talk about us. This isn’t the first time this has happened. And it won’t be the last. I’ve been mistaken for a Hispanic so many times now that I just go with it. And my parents get mistaken for Hispanics or FOBs (fresh of the boat, or people who just immigrated to America from other countries) but even still we don’t take offense or mind. We just go with the flow and move on. But accusing us of doing something illegal or singling us out because of our skin color – now that’s wrong. I’m an American citizen, born and raised. And my whole life, I’ve been treated like I don’t belong here, like this isn’t my country. After the September 11 terrorist attacks, people from my race, whether Indian, Pakistani, or anywhere from that general area, have been targeted and accused of being terrorists. I remember walking in a mall with my grandfather, who wore a turban, and have two teenage guys point at us and say my grandfather was part of the Taliban. We spent weeks, even months, covering theses shootings and police brutality against African Americans and yet when there was a shooting at a Sikh temple in Wisconsin, it got a day, maybe two, of news coverage. No one is throwing protests or is fighting for our behalf. And nor do we want them to, because protests don’t always lead to peace and the outcome we want. Just take the recent NYPD shooting. The Merriam-Webster definition of racism is “the poor treatment of or violence against people because of their race or the belief that some races of people are better than others.” This definition encompasses all races, proving that racism can happen to anyone. But that isn’t what the rest of the nation thinks racism is. Just Google Image search racism and the majority of photos will show white and black individuals standing up against racism. Whites against blacks. No where is there room for other individuals, like myself, to talk about their injustices, and no where in there is there room for whites to talk about injustices to them. We are silly to think that racism only targets one individual or one group. In order to have racism, both sides must be lacking understanding of the other. All lives matter. If you are a living, breathing right-minded individual, your life matters. So how do we stop racism? We don’t really. Educating people is key, but not everyone is willing to listen. Some are so rooted in their believes that trying to tell them otherwise is a battle in and of itself. But that doesn’t mean we don’t try. Nothing happens in a day – work on a few individuals at a time. Prove to them that we are all equals. If I can do at least that, prove to one person that I, a person of Indian origin born and raised in the United States, am their equal, then I call that a victory and I walk with my head high and proud. Is impossible stop racism,but nevertheless will be possible fight against it with good results . Reducing is the key in issues like inequality and racism.